Last Tuesday I happened to turn on PBS in the middle of Rick Steves' travel program about Italy. Tufa rock...Signorelli...stone laid out in stripes----Orvieto! Suddenly I was back in Orvieto, following our friend Kyra down dark, narrow streets. We turned a corner and there, at the end of the street, a sliver of the Duomo glowed. 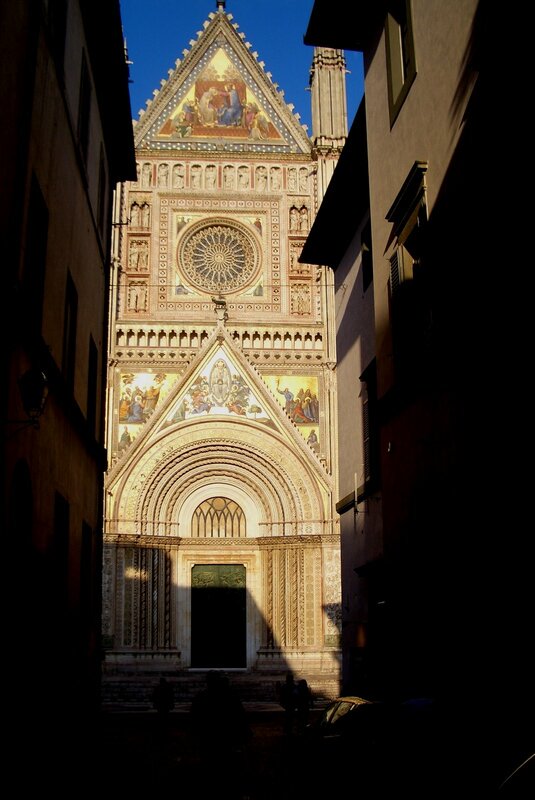 The light reflecting off of the facade, with its gilded, brightly colored mosaics, nearly blinded me. We stepped into the sunlight and gaped at the church. This remains one of my most vivid travel memories. It takes very little to call it forth. There I am, once more walking down a dim street, about to be struck in the heart by a magnificent work of art. A surprise of a house confronted us as we rounded a bend. A triangular room of stained glass hangs out over the front, like the prow of a ship. Shingles rise and fall in waves, following the curves of the walls. Metal bands and circles of orange metal form a roller coaster of a stairway. Mosaics, created from smashed-up ceramics edge the house and decorate the chimney. I hadn't been in this Cincinnati neighborhood in a long time. Surrounded by neat little bungalows, this amazing house is an incongruity. I wonder what the neighbors think. I wonder who lives there. I wish I could drive by this house every day.